necessary steps while covering the timpani yourself. Anyway, I think I can show you the most important steps in my internet photo workshop. a bigger format and a higher resolution. First unscrew the eight long screws, so that you can take off the tension ring and the skin, called the “head”. and let the head soak for some 6 to 9 minutes. 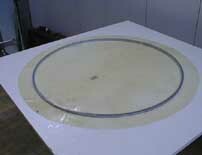 then spray the edge with Teflon spray. 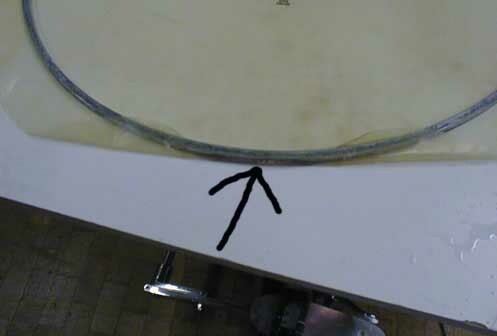 fleshhoop exactly in the middle of the head. … the bulge has to be there!!! Now you place the tension ring carefully on the head. 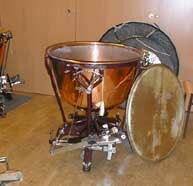 Leave the timpani like this for 1-2 days, then remove the head protector and let the timpani dry for another 1-2 days. PS: This should not be done when it is freezing outside, as then the timpani dry too quickly, get no depth and sound much harder.